Syria's civil war has raged on over the last two months, with neither side gaining the upper hand. Death and destruction has been enormous, and territorial changes few, though not none. Read on for the rundown. 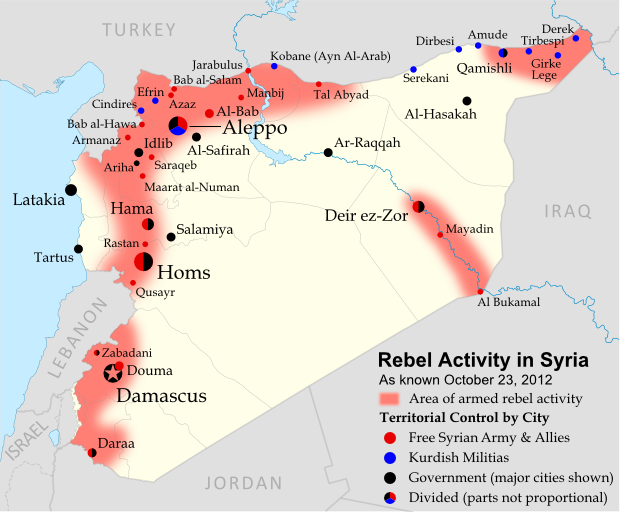 Since our last Syria update in August, the broadest change to territorial control has been the rebels' eastward expansion from Aleppo into ar-Raqqah province, a region that had previously seen little fighting. Most notably, the Tal Abyad border crossing fell out of government hands on September 19. Starting early this month, attempts by government forces to take back Tal Abyad spiraled into low-intensity border clashes between Turkish and Syrian government forces after Syrian shells began crossing into the other country. Meanwhile, as the city of Aleppo remains divided (map), rebel forces have slowly fought their way to modest gains in neighboring Idlib province. On August 12, the fighters secured a new stretch of border villages west of Armanaz, and on the 16th they seized Maarat al-Numan, a strategic town located on the highway between Damascus and Aleppo. Fighting still rages in the Damascus area as well, and it is sometimes impossible to keep track of the constant back and forth between the government and rebels. However, as of last week Douma, the largest city outside of the capital, was reportedly under control of the Free Syrian Army. In the east, they also hold Mayadin, a major eastern town with a bridge over the Euphrates River. Fighting has also begun to spill over into the neighboring country of Lebanon, whose current government is seen as supportive of the Syrian regime. The country is among the Middle East's most diverse, and many groups have sided instead with Syria's rebels. As the situation in Syria is rapidly changing, and journalists inside the country are few, it can sometimes be difficult to keep up with the changes. As a case in point, it turns out that the town of Ariha in Idlib province was taken back by the Syrian army a week before our August 2012 Syria update, though that map still indicated that it was rebel-held. Two more towns have also been added to the map since last time: Zabadani northeast of Damascus was a key rebel stronghold early in the war before falling to the government, and since at least this August it is again largely controlled by the Free Syrian Army rebels. East of Aleppo, Manbij is one of the country's largest rebel-administered towns, after government forces pulled out on July 19. Graphic of Syrian flag is in the public domain (source).